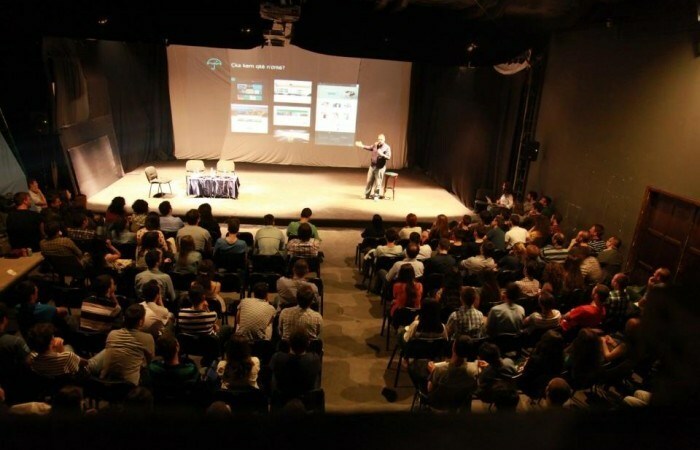 More than 130 participants were present on the 12th edition of BarCamp Prishtina, and as usual the Oda Theatre was full of young people ready to see the presentation of the Community Boost_r project which is being organized by IPKO Foundation, some art by Leutrim Fishekqiu, and to hear a successful story by the Umbrella Team. With a presentation close to 50 minutes, Alicja and Darko explained their experience and knowledge related to the development of the community boost_r competition around the region and how they got involved in this. Darko explained how through the initiative of the citizens, organizations and companies, there can be more citizen activism, while he also mentioned some cases around the region, like the “bribe-o-meter” that monitors the amount of bribery in a regional country. Alicja in the other side focused her presentation on the procedure of the applying with projects to be part of the Balkan Challenge. A civil engineer transferred to a passionate sculpture creator, Leutrim presented many of his work, starting from a six meter tall statue in Izmir, to the five meter tall statue in Prizren, which identifies Sculpfest, a new and interesting festival during winter times in Prizren. Sculpfest has already finished its second edition this year, while some funny stories were shared like opinions of the citizens on how “participants worked for days to finish the ice statues and they left them in city’s square”, showing how people in this city still don’t know the right information about the ice sculptures. The successful freelancers from Kosovo, who has been featured and praised of high quality on www.themeforest.com, was presented beautifully from Burim Shala. He presented to the audience the story of their team, how they started to work, how they left their jobs behind and didn’t accept to create a company nor to have a CEO, but all to work in equal bases in this process. “We gathered as friends in one place, with one goal: to export as much as possible from Kosovo towards the global market” said Burim, who insisted that with great quality comes great value, and of course great money. Their portfolio has been selected as top of the class quality many times.